170 sq. 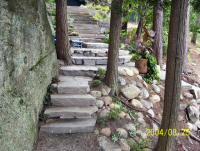 foot beach patio at boathouse dock level and first set of steps leading up 4 story stone staircase. First part or 4 story stone staircase and main 725 sq. foot patio. Main 725 sq. foot patio with connection staircase up and down, the top level of boathouse, and golfcart path to top of hill. Main 725 sq. 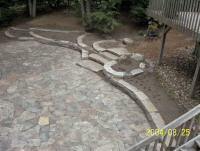 foot patio with staircase leading up to small 64 sq. foot patio and hub. Small 64 sq. foot patio and hub with 4 direction Up, Across front of cottage, to firering patio, or down to boathouse. 120 sq. foot patio with fire pit. 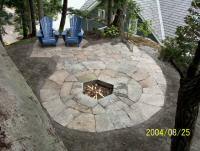 Leaving fire pit leading upto 64 sq. foot patio hub. Top of 4 story stone staircase, terraced planters to support 610 sq. foot patio. Part 1 of 610 sq. 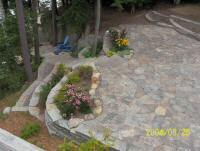 foot patio at the top of 4 story stone staircase. Part 2 of 610 sq. foot patios.